Patricia Terry-Ross began studying the harp with Velma Froude at Cass Technical High School in Detroit. She attended the University of Michigan where she received both Bachelor and Master of Music degrees. While there, she studied harp with Ruth Dean Clark and voice with Rosemary Russell. 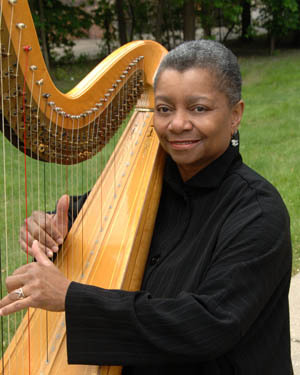 Mrs. Terry-Ross did additional graduate work with renowned harpist Lucile Lawrence at Tanglewood Institute in Massachusetts. Currently, Patricia is Adjunct Associate Professor of harp and choral conducting at Wayne State University and principal harpist for the Michigan Opera Theatre. Additionally, she performs on numerous occasions with the Detroit Symphony Orchestra. While Motown Records was based in Detroit, she played the harp on the recordings of many artists, including Marvin Gaye and The Temptations. For thirty-one years she taught harp, voice, piano, harmony and directed the renowned Harp & Vocal Ensemble at Cass Technical High School. Since the summer of 2006, she has also been the harp clinician at the University of California-Berkeley's award-winning Young Musicians Program. In 2004, Patricia was honored as a recipient of the prestigious Maynard Klein Award, the highest honor given by the American Choral Directors Association - MI, in recognition of her outstanding career as a choral conductor. In October 1999, she was one of 40 music teachers across the United States (and the only one from Michigan) selected to receive the "Music of the Heart" Award for her unwavering commitment to music education. Additionally, she was Detroit Public Schools TEACHER OF THE YEAR and a finalist for MICHIGAN TEACHER OF THE YEAR in 1993. Among the outstanding artists with whom Mrs. Terry-Ross has performed are Luciano Pavarotti, Dame Joan Sutherland, Leona Mitchell, Sammy Davis, Jr., Cleo Laine and Johnny Mathis. In July 1999, she performed in concert with "The Three Tenors" (Carreras, Domingo and Pavarotti), conducted by James Levine. Mrs. Terry-Ross has had the honor of being chosen to play the harp at a private reception for President William Jefferson Clinton and his Cabinet members, and she remains in demand as a soloist, chamber and studio musician throughout the metropolitan Detroit area.